Lip cplor pictured: Laura Mercier Bare Pink Lip Gloss, $25. Necklace: Essie Collection, triangle mother of pearl, $90. Contact Esther@essiecollection.com to purchase. One thing I can never leave home without is my lipgloss! Wearing a natural pink lip color is perfect everyday wear and looks good on all skin tones. Here are my fave picks for subtle, pretty pink lips. Whether you are looking for something super glossy, matte or shimmery, I have you covered! This fabulous gloss by Laura Mercier smells like cotton candy and is super moisturizing and creamy! Nars Cosmetics has given its "cult classic" lip gloss a new formulation with a silkier texture and new applicator. This pink shade made famous by Kim Kardashian looks great on sun-kissed skin. 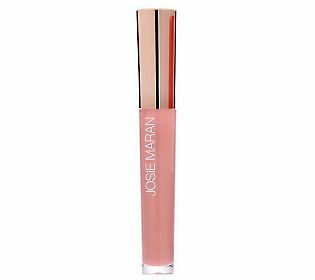 Josie Maran’s eco-friendly line of glosses contain antioxidants and argan oil. I love how soft my lips feel when wearing this light pink gloss. This amazing lip gloss by Chantecaille is super shiny, a bit shimmery and long-lasting! Geri G lipgloss was formulated by uber facialist and make-up artist Geri Giagnorio of West Hollywood. This pink gloss is a bit more matte than the others and offers good coverage and shine. It also smells like bubble gum. I'm addicted!